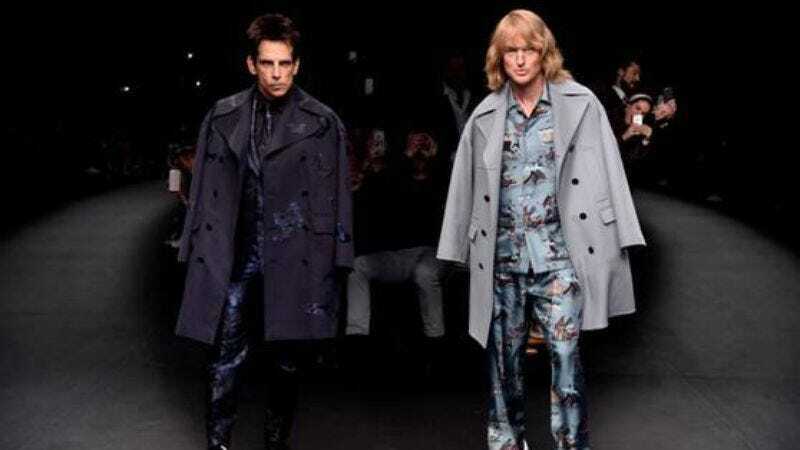 In a move that’s probably both promotional and filming-related, Ben Stiller and Owen Wilson walked the runway as their Zoolander characters—Derek Zoolander and Hansel, respectively—at today’s Valentino show in Paris. Both clad elaborate brocade and overcoats, the pair closed the Fall/Winter 2015 Women’s Collection show, bringing full, fierce blue steel to the runway during a somewhat serious walk-off. The strategic strut also came with news of an official February 12, 2016 release date for Zoolander 2, which—given this stunt and the movie’s IMDb page—is probably filming right now. Mike Rosenstein, who works at Red Hour Films with Stiller, has been Instagramming a number of behind-the-scenes pictures from the filming as well, and they’re totally so hot right now. Justin Theroux wrote the screenplay for Zoolander 2 and is directing. Both Penelope Cruz and Will Ferrell are attached to star, and, given some of Rosenstein’s Instagrams, Cara Delevigne might also be involved.